According to Romans 7:13, the law: 1) Identifies sin and 2) reveals sin’s depth of darkness, revealing our desperation in sin and our need for the Savior both in salvation and sanctification. 14 For we know that the law is spiritual, but I am of the flesh, sold under sin. 15 For I do not understand my own actions. For I do not do what I want, but I do the very thing I hate. 16 Now if I do what I do not want, I agree with the law, that it is good. 17 So now it is no longer I who do it, but sin that dwells within me. 18 For I know that nothing good dwells in me, that is, in my flesh. For I have the desire to do what is right, but not the ability to carry it out. 19 For I do not do the good I want, but the evil I do not want is what I keep on doing. 20 Now if I do what I do not want, it is no longer I who do it, but sin that dwells within me. 21 So I find it to be a law that when I want to do right, evil lies close at hand. 22 For I delight in the law of God, in my inner being, 23 but I see in my members another law waging war against the law of my mind and making me captive to the law of sin that dwells in my members. 24 Wretched man that I am! Who will deliver me from this body of death? 25 Thanks be to God through Jesus Christ our Lord! So then, I myself serve the law of God with my mind, but with my flesh I serve the law of sin. Romans 7:14-25 is a description for all Christians. Like Paul, when we evaluate ourselves against God’s righteous standard, the Law, we find that we all fall desperately short. This section is an expression of deep anguish over the dichotomy of flesh and mind. It is a lament of his soul, pleading for deliverance from the body of sin. 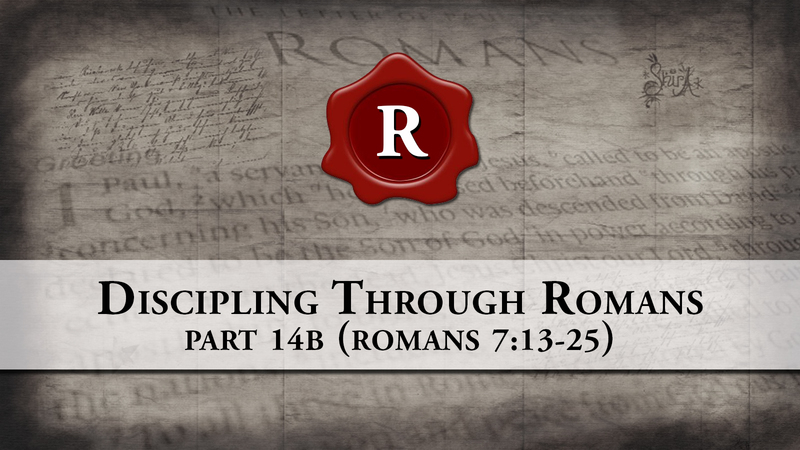 Paul’s character: Paul is grieved over his sin—he understands the immensity of the problem. He purposes to live a life of holiness and righteousness, so he purposes to keep sin distant, but he finds it perpetually pursuing him in his flesh (21), he delights in the law (22)—not viewing it as oppressive, and he never grows weary of it—he aggressively battles for righteousness and battles against unrighteousness (15) and he longs to experience freedom from sin in his flesh as he has tasted freedom from sin in his spirit (24). Delighting in the law (my attitude embraces the law of righteousness)? 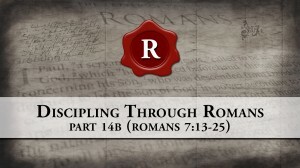 Battling for righteousness and battling against sin? Responding with lament (oh my wretchedness) when I fail to triumph over sin? People either battle against sin or make peace with sin. One who is truly saved in Christ will never be at peace with the sin of the flesh; it is against the new nature of righteousness of Christ that dwells with the child of God. Zooming out – Romans 7 and 8 are chapters that are easy to zoom in and discover great truths, but we should take a moment and zoom out in order to see the big picture of the book thus far. There has to be a reason why Paul is writing 7:14-25 as he is. He has established a pattern in the first few chapters of which I want us to be reminded. The Christian believes the law is spiritual and that it is good, the Christian delights in the law and the Christian chooses (is intentional) to serve the law, however, we admit that sin dwelling in our flesh works constantly against our desire for the law. That is why we have a deep longing for the coming of Christ so that this body of flesh, where sin resides, will be done away with. So the law of God is good in that it reveals our new nature of holiness and righteousness (we embrace the law and hate sin), and sin that dwells within us constantly attempts to trip us as we choose to walk in the righteousness of the law.